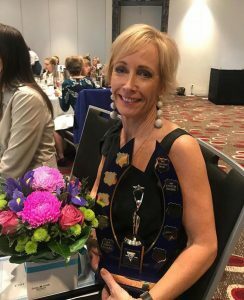 Congratulations to Ceres Senior’s Coach, Lynette Cousins, who was presented with the VCCA Award at the recent Celebrating Calisthenics dinner. Lynette has had a journey through calisthenics for nearly 60 years and has been a passionate participant, coach and more recently an adjudicator throughout that time. She has coached Sub Juniors, Intermediates and Seniors at Ceres and many calisthenic and graceful soloists. She also helps girls achieve their personal best when performing their Pupil Skills and Medals. Lynette’s passion and commitment for calisthenics shines through making her a very worthy recipient of this prestigious award! Ceres soloists to represent Victoria at Nationals. Zoe Formosa wins Vera Hopton award!